Susan has a special interest in Podiatric Biomechanics and Paediatric Biomechanics. In October 2005 Susan set up Brightwell Clinic where she is the Clinical Director. Susan gained accreditation for the Clinic with the Society of Chiropodists and Podiatrists. She has evolved a team around her who have an interest in treating people's injuries especially in motion. Susan trained at the Chelsea School of Chiropody for three years and is a member of the Society of Chiropodists and Podiatrists and is registered with the regulatory body Health Professions Council (HCPC). 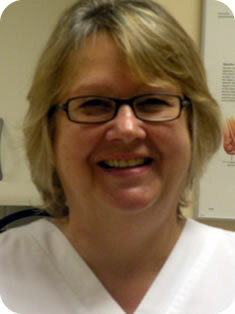 Susan has extensive experience in managing many foot and foot-related conditions. She worked in the NHS for 10 years, specialising in Diabetic and rheumatoid foot care. Having a family required her to find more flexible working times so she moved into the private sector. For the last 27 years Susan has worked within musculoskeletal teams, spending many years working with Dr Peter Thomas Sports Injury Physician at the Reading Clinic and at BUPA Wellness when it took over that clinic. Susan not only treats painful nails, corns, calluses and verrucae but has extensive experience and knowledge in treating gait related problems using orthotic therapy enabling the treatment of symptoms resulting from lower limb overuse such as injuries of the feet, ankles, knees, hips, low back pain and even headache and jaw pain. Susan is trained and licensed to use local anaesthetics and to carry out nail surgery under local anaesthetic. Susan attends many courses each year keeping up to date with the latest advances in this area of medicine through continuing professional development (CPD) and was Chairman of the Berkshire State Registered Chiropodists and Podiatrists Association for 8 years. Susan is registered with most major private medical insurance providers including Norwich Union, Pru Health.